Between Thanksgiving, Christmas, Hanukkah, and New Year’s, many of us spend more time with our families in the final five weeks of the year than we will the other 47. For people who don’t get along with their families, it can feel like there isn’t enough spiked eggnog in the world to make holiday dinners easier to get through. 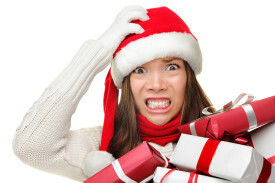 In my 35 years as a marriage and family therapist who specializes in anger management, I’ve discovered that the holidays can be survived, and can even be even pleasant, if you do a little advanced preparation. Here are four strategies to get you through this season of joy without the help of a stiff drink and a cab back to the airport. We all have a tendency to revert back to our childhood selves when we’re with our families. We can be successful professionals with families of our own, but as soon as we step through the door to our parent’s house, it’s like we step back in time. It’s normal for your parents and siblings to treat you like the teenager they once knew because that’s how they still see you and it’s normal for you to act like the 13-year-old you because that’s how you’re familiar with behaving around your family. You’re not alone in feeling this way according to social scientists (link is external). The trick is to not judge yourself too harshly for reverting to childhood behaviors and to not let the way your family treats you get too far under your skin. Remind yourself that the way you interact with your family doesn’t reflect on who you are as an adult. When a family member says something upsetting to you, blowing up at them or snapping at them with a passive-aggressive comeback won’t make anything better. To keep your cool, try practicing mindfulness. Excuse yourself and find an empty room to escape to for a quiet moment of slow, calm breathing or take a walk around the block. A holiday dinner probably isn’t the time to tell the family member that what they said was hurtful, but trying to swallow your anger isn’t likely to make you feel much better either. So, after you’ve taken those calming breaths or that walk, write down what it is that they said and how it made you feel, then put it in your pocket and save it for a later conversation. If your family obligation is just a dinner, plan on arriving late and leaving early. If yours is a finger-foods-to-nibble-on-before-dinner family, find out what time the main meal will be served and arrive just early enough to take your seat at the table (arriving too late and interrupting the meal is more likely to cause a fight than avoid one). Then, leave early if you can. If you go home for the holidays and are stuck for a few solid days with your family, make plans with a friend to break up your time there. Go catch a movie. It’ll be a nice distraction, a break from the stress, and maybe even something to talk about when you meet up with your family again. Most important of all, be nice to yourself this holiday season. The holidays can be tough and your family can trigger you the way no one else can. While you’re sipping eggnog and starting to feel like your insides are boiling with rage, practice loving self-talk. “You’re beautiful and you’re strong and you’re OK just the way you are.” And remember, only a few weeks to the finish line, January 1.